Please check the size guide below to make sure the sizes you pick are correct. 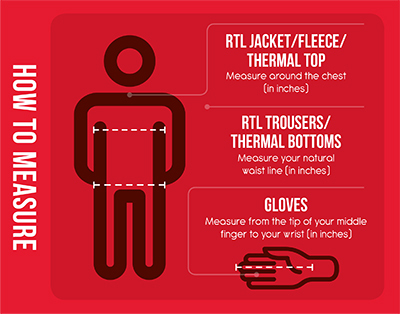 Please carefully measure around the chest, as shown in the diagram opposite, using the upper line as your guide. Please carefully measure around the waist, as shown in the diagram opposite, using the upper line as your guide. Please carefully measure from the tip of the middle finger to the wrist, as shown in the diagram opposite.